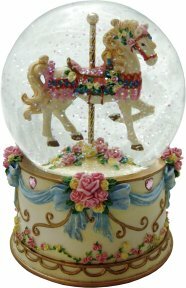 Musical Carousels of Distinction "Destiny" An exquisite musical carousel water globe from the Distinction Series. This superior collection of musical carousels are individually cast with the finest of detailing and meticulously hand painted. Turn the music box by the winding key underneath and gently shake to make the glitter inside the globe shimmer whilst you listen to the magical melody. (The horse remains static in this water globe) Tune : When You Wish Upon A Star Approx Size : 14 x 10cm (5 1/2" x 4") Order Code : BBCAR011 Price : £39.00 *Please note this is an ornamental item that contains small removeable parts. *It is not a toy and not suitable for children to use unattended.